V1181. 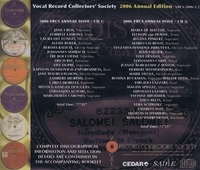 VOCAL RECORD COLLECTORS' SOCIETY – 2006 Issue, incl. JANE CROS (Tannhäuser - Dich, teure Halle); FORREST LAMONT (Cavalleria Rusticana - Siciliana); LAURA DEL LUNGO (Mignon - Elle est là…Elle est aimée); ALEXIS BOYER (Le Maître de Chapelle - Pour imiter ton charme séducteur); BERTHA KALICH (Sappho - Matouschka Golobouschka (Mother dearest) [J. Gordon]); JOHANNES SEMBACH (Frühlingszeit [Becker]); EBE BOCCOLINI (La Wally - Ebben, ne andró lontana); ERICH BYE (Tannhauser - O du mein holder Abendstern); LILY DUPRÉ (Les Huguenots -Au beau pays de la Touraine); KAPITON DENISOVICH ZAPOROZHETS (Song of the Flea [Moussorgsky]); JANE BOURGUIGNON (Sapho - O ma lyre immortelle); LAMBERT MURPHY (Boat Song [Ware]; LIVINE MERTENS (Roméo et Juliette - Que fais-tu, blanche tourterelle? ); CARLO MORELLI (Il Trovatore - Il balen); HELEN GAHAGAN DOUGLAS (Tosca - Vissi d’arte [Unpublished Victor (mx T-1020-1)]); FERNANDO AUTORI (L’Amore dei Tre Re - Italia, Italia e tutto il mio ricordo! ); MARGHERITA CAROSIO (I Pastori [Pizzetti]); ELSA ALSEN (Tristan und Isolde - Liebestod); MARIA DE MACCHI (Lucrezia Borgia - Come è bello); ELLISON van HOOSE (O come with me in the summer night [van der Stucken]); REGINA PINKERT (La Perle du Brésil - Charmant oiseau); MARIO LAURENTI (Hérodiade -Salomé! demande au prisonnier); EVGENIYA IVANOVA ZBRUYEVA (A broken vase [Arensky]); JEAN VALLIER (Le rêve passé [Helmer - Krier]); TINA DESANA (Ruy Blas - O madre mia dall’intimo [Marchetti]; FERNANDO CARPI (Mefistofele - Giunto sul passo estremo); JEANNE KOROLEWICZ-WAYDA (Lohengrin - Euch Lüften, die mein Klagen); HERBERT WITHERSPOON (By the Short Cut to the Rosses; Black Sheela of the silver eye [both old airs]; MARIE DELNA (Le Prophète - Ah! mon fils! ); ROSINA BUCKMAN & WALTER HYDE (O lovely night [Ronald]); VIRGILIO LAZZARI (Ernani - Infelice! e tuo credevi); MAGDA SPIEGEL (Rienzi – Gerechter Gott! In seiner Blüthe bleicht mein Leben); HIPOLITO LÁZARO (Maria La Tempranica - Romanza de Miguel [Torroba]); YVONNE BROTHIER (Manon Lescaut - C’est l’histoire amoureuse (L’Éclat de rire) [Auber]); THEO BEETS (La Juive - Rachel, quand du Seigneur); VERA SCHWARZ (Der Widerspenstigen Zähmung - Die Kraft versagt [Goetz]); CHARLES SOIX (Le petit Grégoire [Botrel]); HJÖRDIS SCHYMBERG (Si J’étais Roi - Des souverains du rivage); REINALD WERRENRATH (Special Holiday Greetings Record, Victor “Personal Record” (mx C-28896-3), recorded 15 Nov., 1923). 2-VRCS-2006. Transfers by Seth B. Winner. "This compilation marks the fiftieth anniversary of the Vocal Record Collectors’ Society. In addition to the traditional selection, a second CD contains eighteen records issued on VRCS vinyl LPs between 1959 and 1992. Both discs have been scrupulously transferred from good original copies and the standard of presentation, including full recording details and excellent biographical notes, is quite exceptional….This is an admirable souvenir of an important occasion, and all that remains to be done is to congratulate the Vocal Record Collectors’ Society on achieving its Silver Anniversary and wish it well for the future."